Review for Night Watch posted. Pete, your rating of "2" for Final Destination in the main thread which lists everything you've watched so far, does not match the review you wrote where you rated it a "4". Thanks Hal... I always use Copy and past to save on typing... probably just forgot to update the rating for it. Fixing it now. Review for Resident Evil posted. Review for Resident Evil: Apocalypse posted. Review for Resident Evil: Extinction posted. Review for American Psycho posted. Review for Hellraiser: Hellseeker posted. Overview: THE YEAR IS 2019. A mysterious plague has swept over the earth, transforming the majority of the world's population into vampires. Humans are now an endangered, second-class species – hunted to the brink of extinction and then farmed to feed the vampires' need for blood. The remaining humans are now in hiding and as supplies run low, the terrifying consequences of vampire starvation are becoming more apparent – the normally civilised vampire population will turn into literal blood sucking monsters if a blood substitute is not found. 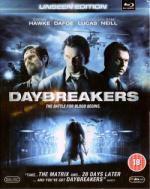 Stylish, provocative and action-packed, DAYBREAKERS stars two-time Academy Award® nominee Ethan Hawke*, Willem Dafoe and Sam Neill. *Supporting Actor, TRAINING DAY, 2001; Adapted Screenplay, BEFORE SUNSET, 2004. My Thoughts: Oh dear I'm not having much luck with my choices for the October 2010 Horror Marathon. After 2 werewolf failures I thought I'd try a vampire film. A slightly different concept here with the vampires now the race in the majority and the humans are in decline so the 'civilised' vampires are looking for fresh methods to generate blood for their survival. It wasn't too bad a film, better than the earlier two in this marathon, but to me Ethan Hawke seemed to be acting on some form of auto-pilot in that he just did the bare minimum that was needed in each scene. I have seen other films with him (Before the Devil Knows You're Dead, Lord of War, Taking Lives, Training Day) but to be honest can't remember much about his acting in those. A series of murders is being committed near London and many think it is the work of a female werewolf and a young woman engaged to be married (June Lockhart) is certain that she is the werewolf committing the ghastly murders. This is an interesting movie and done with some style, but anyone wanting to see a hairy werewolf will doubtless be disappointed in this one. But I liked it. Of course, I have always liked seeing June Lockhart (I grew up on her Lassie series making the moment she is terrified of the dogs a bit ironic) so that probably helped me appreciate this film more than a lot of people would. Of course, it did seem odd that the main characters didn't have British accents! 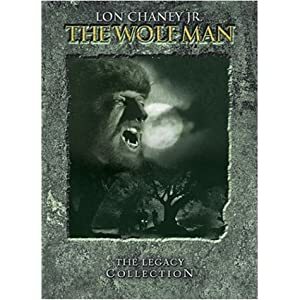 This movie is part of the movie set The Wolfman: The Legacy Collection. I need to watch some of my Wolfman set again! I only seen She-Wolf of London once... I remember enjoying it.. but I did feel it felt strange to be in the set... I felt it was more a mystery movie then a monster movie. But still good. I think I did pretty good today... got through 7 movies! Review for Blade II posted. Review for Blade: Trinity posted. Sorry, but I think movies just got pushed to the way side. Looks like it still fits to me Sébastien. I am watching both movies and TV shows! Well... I think I am done for today. I don't think I did too bad today... 5 Movies... 2 TV Eps... and 1 Other.